The Plavac Mali comes primarily from the Plaže, steep stony south facing sites that family Carić farm by hand and without synthetic treatment. The largest holdings are in the Zavala area near the famed Ivan Dolac vineyards. The amount of sun is staggering at these expositions, to the vines are head-trained to protect the fruit. Cover crops are encouraged (rosemary, sage, fennel,...) and all the work on these steep slopes is manual. Due to the extreme winds and drainage, little to no spraying (sulphur) is required. Plovac Ploški, derives from the name of the grape variety, Plavac (Mali), and the word Plaže (the vineyard area), so what it really means is “Plavac from Plaže". Since time immemorial Carić has tended grapevines on the Croatian island of Hvar. 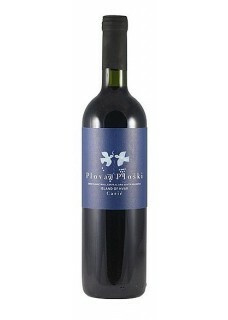 This pure Plavac Mali, local red grape is fermented with wild yeast and aged in large old barrels for two years minimum. In every vintage you can taste the wind, sun, sea, and the Mediterranean biodiversity surrounding these Island vineyards." Food pairing: “pasticada”, lobster stew, cuttlefish risotto or barbecue..